Many people say with confidence, that they ‘believe’ in God. Many of these same people think that this is enough to guarantee that their sins are forgiven and gain them admission to Heaven. However, is this simple ‘belief’ in God enough? Is this ‘belief’ the same as the ‘faith’ spoken of in the Bible? Let us examine this concept a little closer. While ‘faith’ surely includes the element of ‘belief’, they are not one and the same. Certainly one must believe that something, or someone, exists before it is possible to put one’s faith in that person or thing. However, I can believe some things that do not affect my life. I believe China exists, but I do not live my life any differently because of my belief. The Bible tells us that this type of ‘belief’ is not true faith and will not result in a saving relationship with God. To put one’s ‘faith’ in something, or someone, means that one is putting his or her trust in that person or thing. Who or what one trusts can have far-reaching, even eternal, ramifications. It means reliance on, dependence upon, that person or thing. I can say that I believe a plane can take me from here to there, but if I’m afraid to get on it, I reveal that I have no ‘faith’ in that plane. Also, if I do not get on the plane, I have no reason to expect it to take me anywhere. I must exercise my ‘faith’ in that plane, by boarding it, if I am to receive the benefits it offers. When we have true saving faith in Jesus Christ, we see the world and its system in an entirely different way. The Holy Spirit enlightens us as to the true nature of things and actually causes us to think differently, “For those who live according to the flesh set their minds on the things of the flesh, but those who live according to the Spirit set their minds on the things of the Spirit” (Romans 8:5). We are instructed to make this a goal of our spiritual life, “Do not be conformed to this world, but be transformed by the renewal of your mind” (Romans 12:2). If we truly are Christians, dedicated followers of Jesus Christ, we will grow more to see our existence the way God sees it. Simply to say “I believe in God” means very little if it is merely coming from the lips and not from the heart. I have heard of, and have known, some people who claim to be followers of Christ; however, their lifestyle remained the same after they became Christians as it was before they became Christians. They still lived the same way, talked the same way, and had the same mindset as they did when they were living in rebellion to God. Were they exercising true faith? Jesus said, “If you love me, you will keep my commandments” (John 14:15), meaning that our actions will reveal the change our heart has gone through when we became His true followers. Conversely, if our lives do not exhibit a change of allegiance from self to Jesus, we have good reason to doubt our salvation is real at all. John writes, “And by this we know that we have come to know him, if we keep his commandments” (I John 2:3). True faith is evidenced by a change in the way we act. If anything in our lives is more important than God, our priorities are misplaced and we should examine ourselves to see if we have truly given our lives to Christ. If our lives are focused more on our jobs, our favorite sports team, the next new technological toy, our love life, or anything else that diverts the center of our attention away from God, we should question the validity, or at least the maturity, of our faith. Our finances: If we are so focused on how much money we are making, or how high up the corporate ladder we can climb, we must readjust our focus…our focus is on wealth instead of God. Also, on the other side of the coin, if we are so worried about not having enough money, our focus is on our need rather than on the One who provides for those needs. Our thought life: What we spend out time thinking about reveals a lot about what we think is most important in our lives. While it is not wrong to think about things other than God, when we think about things to the extent that any thoughts of God are pushed out of our minds, we are in danger of shipwrecking our faith (1 Timothy 1:18-20). The Bible tells us to “pray without ceasing” (1 Thessalonians 5:17) which simply means keeping the lines of communication open between you and God at all times. Our priorities: How we spend our time, money, and energy reveals what we think is important. Where does God fit into your life? How important is prayer and Bible study as opposed to making sure you do not miss your favorite television show? The Bible tells us to “seek first the Kingdom of God and His righteousness” (Matthew 6:33). Our relationship with God should be the most important thing in our lives…if we have true faith. 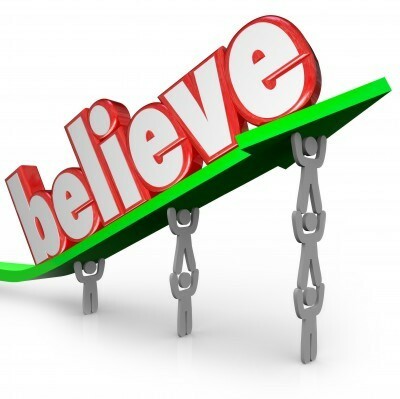 “Belief” can be simply a passive mental acceptance which amounts to nothing when it comes to how it affects our life. Simply to say “I believe in God” means very little if it is merely coming from the lips and not from the heart. People can, and do, say that they ‘believe’ in God, but their lives never change at all. However, when one has true faith in God, one’s life cannot help but reveal this truth. True faith, dependence/reliance/trust, in God reveals itself in our actions, our thought life, and our priorities. A saving relationship with the Creator and Sustainer of the universe can result in nothing less than a radical readjustment of our entire worldview. We will love God with all our hearts and we will love others as we love ourselves (Matthew 19:19, 22:39; Mark 12:31; Luke 10:27; Romans 13:9; Galatians 5:14; James 2:8, and more Old Testament references). If we claim we are Christians, but this is not the attitude of our hearts, it would be wise to ask God to search our hearts, cleanse us, mold us into the people that He wants us to be, and strengthen our faith. Fantastic work Robert. I had counseled with one woman who was contemplating marrying a man who said that he believed in God but I told her that so does the Devil and the fallen angels, demons, but that doesn’t mean that they have saving faith. I wish I could have referred her to this fine article (although it was not yet published) to help her understand that she needed to be sure to marry a Christian and not just someone who “believed in God.” You made it crystal clear that belief and faith are not the same thing. Thank you brother. Well done. Wonderful analysis on this Robert. Thank you for elaborating so clearly on faith and believing. God bless you brother! I completely agree with Jack. You have made the difference between belief and faith clear with regard to how we should live as Christians. for me, faith is a stronger conviction than belief, after reading this article. You started off by saying “Many people say with confidence, that they ‘believe’ in God. Many of these same people think that this is enough to guarantee that their sins are forgiven and gain them admission to heaven”. While this in itself is not quite correct (what people believe, I mean, not what you said), I always thought that people were saved if they believed that the only way into heaven was their belief that Jesus died for our sins and is our Saviour. So while I agree with your article about faith and belief, with our faith being demonstrated in the way we live, while belief is not always so demonstrated, please could you just expand on your first point for me and whether the faith you wrote about is also a prerequisite for heaven? Please don’t get me wrong – I completely agree that, as true Christians, we should not only believe, but also have faith in God and live our faith… But I just wanted to be sure on the teachings I have heard. Thanks again for the article. It has given me motivation and strength in my daily living. Thanks for reading and commenting Nikita. A couple of biblical examples may help make this clearer. In Luke 23, we read about the thief on the cross who truly put his faith (belief) in Jesus. The thief had no opportunity to live out his faith, but he was truly saved, as Jesus’ words reveal (Luke 23:43). Had the thief lived, he surely would have exhibited a changed life. This is true faith, the kind that results in salvation. James, writing about a shallow kind of belief, says, “You believe that God is one; you do well. Even the demons believe—and shudder!” (James 2:19 ESV). The demons know the truth of God, but they do not submit themselves to Him or worship Him. This kind of belief is not the saving kind. I am reading a book right now that had a great illustration of this: Putting our faith in Jesus should be like getting hit by a Mack truck going 70 miles per hour. No one could say, “Hey, I stepped out into the highway today and a Mack truck going 70 miles per hour hit me. It’s amazing; it didn’t change me at all.” They might say it, but no one would believe them. The same is true with saying you ‘believe’ in Jesus, your life should be radically different because of your faith. How could it be possible for someone to truly ‘count the cost’, understand all that God has done for us, commit his or her life to Jesus, but his or her life not show any difference? How could that decision, commitment, not make a huge difference in the way life is lived? God bless you, Nikita. I hope I’ve cleared some things up and not made them more muddy. In short, the Bible never leads one to belief that one can be a follower of Jesus and not have it show in their lives as evidence of their relationship with Jesus. Praise God. He uses the weakest of vessels (Me) to get His Word to others. May God bless you richly. In hebrews it says faith is the assurance of things hoped for and the conviction of things not seen. You can’t say you believe in Christ and have no faith. It comes hand in hand. A truly well written article. Thank you for sharing your story here. It will surely be a great encouragement for those who are dealing with similar struggles. Our safest action in any situation is to trust God. God bless you. NOT – just because you believe that to be true.. BUT – What do you believe you know? The question is – What can authenticate the glory of his very existence in heaven… That is unknown to man to date? First off, I love what you wrote. I am doing a study on “faith” and you used a lot of verses that I implemented into my study; good stuff. Secondly, I was reading and I saw that you stated that 2nd Thessalonians 5:12 says “pray without ceasing”, and I know that there isn’t 5 books; only 3. I double checked where in the Word it stated “pray without ceasing, and it was located in 1st Thessalonians 5:17. Anyways, just wanted to give you a heads up and make sure you double check scripture locations because Revelation 22:19 states “do not add nor take away’ from the bible. I understand it probably wasn’t intentional but we still need to be careful. It is Christians like you who encourage me to continue to write articles about the Bible. Your comment tells me that, like the Bereans (Acts 17), you consider it of utmost importance to verify what you hear, or read, being taught concerning the faith. I thank you for catching my mistake. I am amazed that it took so long, as I wrote the article in 2013. Others may have noticed it, but you are the only one who pointed it out to me. I am in full agreement with you on the importance of being as accurate as possible when teaching/preaching/ writing about the Bible or things concerning biblical Christianity. I don’t know how I made that mistake, but I apologize to you, and anyone else who might have been confused by my missed reference. I have sent an email to the site editor to correct my goof. Once again, I thank you for pointing it out to me and I want to encourage you to continue to ‘search the Scriptures daily’. God bless you, brother. Thank you for your thoughts – very powerful read. My faith is so strong that when I first read about having faith in a plane while travelling: I laughed! My faith is in the Lord Jesus Christ and nothing else. I understand that you mentioned the plane for the purpose of explaining faith in something, but as I am a believer -Jesus is Lord! John 3:16 – whoever believes in him should not perish but have eternal life. John 20:31 – but these are written so that you may believe that Jesus is the Christ, the Son of God, and that by believing you may have life in his name. John 6:47 – Truly, truly, I say to you, whoever believes has eternal life. John 5:24 – Truly, truly, I say to you, whoever hears my word and believes him who sent me has eternal life. All of these verses talk about believing being the way to salvation. How does Ephesians 2:8-9 – For it is by grace you have been saved through faith…. fit in. Is the word “believing” in these verses the same as faith in Ephesians 2:8? Thanks so much for your time and insights! Only believe and you are saved. Hallelujah. Recently I have heard opinions or arguments concerning faith and belief in God. It seems as if some of us could be spiritually blind. We fell to realize that salvation is a matter of the heart. For us to understand faith and belief, we must understand our hearts. Quickly, we are all born sinners. We are evil people who stubbornly follow their own hearts and sought after other gods to serve and worship. We don’t want God! This is why it is a gift of God, not a result of works. So, we can’t boast by saying that we chose God freely and willingly! This is why God the Father had to make a predestined people for His son who are zealous to practice good works freely and willingly. This is why Jesus died for us peculiar people, the redeemed. Listen! We were drawn to Christ, because our Father in Heaven allowed the Good News to penetrate our harden hearts, and order to receive the true light of the Gospel of Jesus Christ. Once we sought forgiveness, confession and belief putting faith(trust) in the Lord our God Now, by grace we have been save through faith. Our broken lives are a testimony of His saving grace. Now that’s faith and belief in God! Amen! Love you all! Oh! By the way, man added verses numbers to the scriptures in the fifteenth century. Forgot, very good article by the way Br Robert Driskell. I was speaking with my son the previous night regarding this topic. I was lead here also for assurance. Glory to God! Thank you for the article… It was very enlightening and thought provoking. I think it boils down to this: Belief can be found on the lips and/or in the heart. Faith resides ONLY in the heart. I believe that true faith is the same as true belief and true belief is the same as true faith. There isn’t any difference in belief and faith, except in the spelling of the word. Faith sounds stronger than belief, but is that the case. Who taught us this? Belief, trust, and faith all mean the same thing. It is simply a matter of perspective. Who is the object of your faith, belief, or trust? I really am confused by your article because I truly can’t see much of a difference between the words. If I believe in God, then I should trust Him and have faith in Him. If I have faith in God, then I should believe in Him and trust Him. If I trust God, then I should have faith in Him and believe Him. You see, these words are interchangeable because they are the same, not similar but exactly the same. Go argue this fact! I think there are several different definitions of these three words. It just depends on the definitions we use. I don’t intend to argue or even disagree with you, but I can’t help but to speak the absolute truth of the Word of God. In the Bible the words have the same meanings. Hello Ryan. It is different in the sense that we believe what God says in His Word and belief shows up as obedience, and our faith is in Christ, so we believe what God says in His Word and have faith in God to do exactly as His Word says. I won’t go argue these differences as believer’s are not to be contentious over things that are not essential to our salvation. I love the dialogue. Great article. It has help me tremendously. Many years back (I’m 50), I heard a story that helped me understand the difference between belief and faith. I’ll relate it as best I can remember. Some may already know it I’m sure. There once was a great tightrope walker who was going to do his latest tight rope across a very deep canyon. Many people gathered to see his performance. He walked the tightrope across the canyon and back and then asked the audience if they believed he could push a wheelbarrow across the canyon and back. They all shouted yes we believe you can. He proceeded across the canyon and back pushing the wheelbarrow to the loud applause from the crowd. To make things even more interesting he asked the crowd if they believed he could push the wheelbarrow across the canyon on the tightrope with someone in it. Then he asked: “Who’s first?” and the crowd went silent. Point of the story, for the Christian, is that believing is a small step in the right direction, while faith is a huge jump. We can believe quite easily, but jumping into the “wheelbarrow” takes faith, as it challenges the impact of what we believe and challenges the personal cost to us and so on. Jesus Himself is the author and perfecter of our faith according to Hebrews 12:2 (worth reading whole of Hebrews 12 for context). I don’t have all the information, but quite often (e.g. John 3:16 and Acts 16:31) in the Bible we see belief as the first step to salvation and then faith follows right behind. In the book of Acts account: the request to believe in the Gospel was followed by faith and action from the jailer and his household. We can thus perhaps say that faith is putting our belief into action and Jesus initiates and continues that faith if we offer up even a small amount. Blessings to all on this forum in Jesus Holy Name. Thank you sir. This is a good analogy. “Maybe WE actually “Give-Up” FAITH for our “Beliefs”…..Belief IS about justifying something…Perhaps Evil/$$$$$…. Faith is on a far Higher level? I am heartened by the article and the conversation of this thread. Biblically I find evidence that the Holy Spirit moves like the wind, as Jesus explained to Nicodemus. I also find that God gives a measure of faith to each of his people, those who are born of God and not by lineage, culture, nor personal will (Jn1.13ff). I have and will again have to change beliefs about things as I learn more and grow spiritually. Faith can only be exercised or not; and if not Jack becomes a dull boy. I was also glad to see the thread has continued activity. It means “signs of life”. Yay! Thank you kindly Mr. Anderson. You are very encouraging sir. Next post: Why Did God Send Jesus To Die? Was It Necessary?